Pneumatic Rivet Nut Installation Tools are ideal for high-volume projects and applications. They allow for a faster rivet nut insertion process, and their use reduces operator fatigue that can often be associated with the use of manual tools. They require a source of compressed air for operation. These tools can be successfully deployed in a wide range of industrial applications. JHP Fasteners offers a wide range of pneumatic rivet nut installation tools, all of which are constructed from high-quality materials to ensure optimum performance and reliability. Give us a Call or Contact Us, were always glad to help you find exactly what you need for your next project. An economical choice for thin-walled rivet nuts. These tools are lightweight and easy to operate. This type of tool spins the mandrel to thread the nut. Once the nut has been threaded, the mandrel is spun again to collapse the nut. The spin/spin type is offered in three configurations. Several of the spin/spin tools can be equipped with a right angle attachment to facilitate access to hard-to-reach locations. The use of an air regulator, air filter, and lubrication system is recommended to minimize the wear of internal components over the life of the tool. 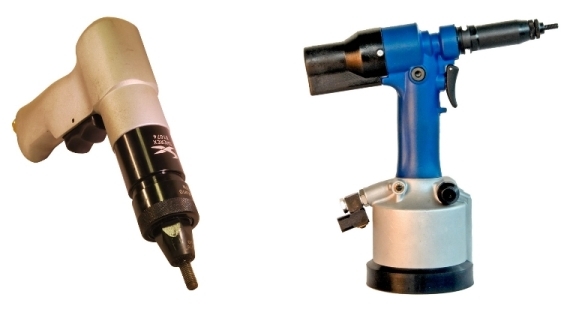 These tools are available in “Pull-to-Pressure” or “Pull-to-Stroke” variants. The tool spins the mandrel to thread the nut and then pulls the mandrel to collapse the nut. The tool will pull to either a set pressure or a set stroke. Flex-5P: Pull to pressure version. Flex-5P-IL: Pull to pressure “inline” version. Flex-5S: Pull to stroke version. Each of the tools listed above provides a high-speed and ergonomically friendly approach to rivet nut installation, and are well suited for use within any production environment. Their solid construction ensures high reliability within even the most challenging environments.